Well-used technical exercises enable cellist to master great cello works. Yet many pieces still contain their own peculiar stumbling blocks and there are many obstacles that can only be overcome with a certain expertise. 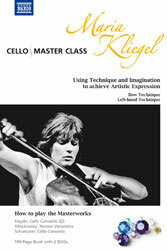 In her book and DVD project “Using Technique and Imagination to achieve Artistic Expression ”, the famous cellist Maria Kliegel opens up a new avenue that is intended to help advanced cellists over these obstacles. Through her concert performances as well as in the recording studio and as a teacher, she has gathered considerable experience of specific aspects and pitfalls of the cello technique. Using numerous examples from the repertoire, the book is a distillation of her experience, while the 2 DVDs provide a demonstration of the cello techniques described in the book. She also plays and analyzes the “infamous” passages from the cello concertos by Haydn (D) and Schumann and from Tchaikovsky’s “Rococo Variations”. Frequent sources of errors are exposed, tricks shown, and various tips on how to get more out of practicing are given along with helpful interpretative suggestions. Release on the Naxos label in December 2010.